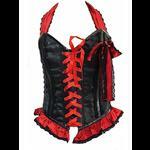 A sturdy boned corset with a flattering sweetheart neckline made from red and black damask fabric with a flat steel boned busk front fastening and wide black satin ribbons sewn into the seams and tying at the waist. 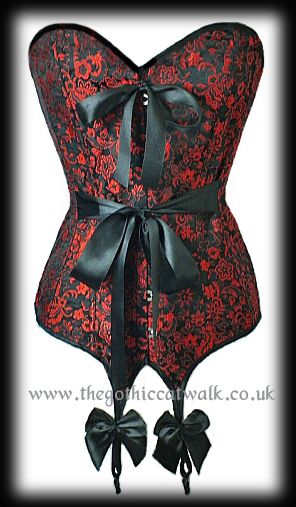 The corset has shaped suspenders at the lower front and back finished with black satin bows and a ribbon tie at the centre front. The back of the corset has metal eyelet and soft cord adjustable lacing. The bust and waist measurements given below can be extended by a further 2" to 4" by adjusting the back lacing to fit. Bust: 30" Waist: 25" Hips: 32" Length at side: 15"
Bust: 32" Waist: 27" Hips: 34" Length at side: 15"
Bust: 34" Waist: 29" Hips: 36" Length at side: 15"
Bust: 36" Waist: 31" Hips: 38" Length at side: 15"
Bust: 38" Waist: 33" Hips: 40" Length at side: 16"